We, well, my kids really love art, but I struggle with coming up with ideas and certainly with teaching it since I don’t feel strong in this area, so we were really happy to check out My ARTistic Pursuits, Inc.– specifically, their Middle School 6-8 Book One The Elements of Art and Composition program. We used this book as a self-study program for my 6th grader (he’s 12). The book contains elements of art, combining the elements, and even a little bit of art history. Each section starts with a lesson and ends with a project. I really appreciated that the beginning of the book included not just a table of contents, but what you would need for each semester of art supply-wise. There is nothing that derails a day for us more than realizing we need to just “run to the store for X”. I also appreciated the “What parents want to know” section, which explained how the first lesson of each unit builds vocabulary and understanding of a concept, the second lesson is art appreciation/history, the third lesson is technique, and the fourth lesson is a final project. This means that as you study each concept, you will do it over four lessons and really develop both the skills to identify it in other’s work and use it in your own. They suggest scheduling art class for two days a week for about an hour over a 36 week period, however, again, you could easily provide this book to an art-inclined child and let them use it at their own pace, which is what we did, and it has worked very well for us. Riley knew several of the concepts from having taken art lessons in-studio before, but he never complained about the lessons being boring or repetitive. He also liked that it was a little more self-paced so if he was really interested in a topic he could spend more time on that week’s lesson and project, or if it was something he didn’t like as much, he could complete it and move on. 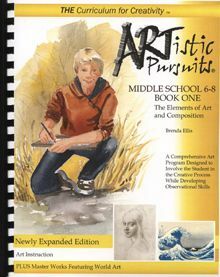 If you have students in other age ranges, ARTistic Pursuits has books for them, as well. They have books at the primary through high school age ranges, and I am sure all of them as are positive and can-do as the Middle School book was for us. I think this would be a great book to have on hand, whether you’re looking for a homeschool book for art for next year, or whether you’re looking for something that your student can work on daily over the summer. If you’re interested in the other grade levels, you can visit ARTistic Pursuits online, or you can click the link up below and see how other homeschool review crew users felt about the levels that they tried. We liked the Middle School book, and think that it’s a great buy for anyone looking for an at-home art option for their child!